We cannot help these single parent families when crisis strikes without your support. When a child is sick, all they want is their parent by their side. Donate today! Compassion Can’t Wait, a non-profit foundation was established as the Andre Sobel River of Life Foundation. On this, their 20th anniversary, they changed the organizations name, to formally recognize the mission that they have implemented to better reflect what they do. For a child with a life threatening illness there is pain and fear, at a time when they need to be loved, cherished and advocated for, as her son Andre was. Soon it became clear why parents could not be there; because they were single. These parents without a safety net had to continue to work, to keep the family’s insurances intact, to keep a roof over the heads of their other children, food on the table and to continue to have transportation. Life is made up of so much more than these essentials, yet these soon disappear for a single parent with fewer options. Compassion can’t wait came to recognize that the combination of increased divorce/separation rate along with increasing pediatric illnesses produced a population that is underserved and unseen. They hosted a Think Tank at the NIH that established some facts that were previously merely anecdotal. The ASRL study shows that 78% (8 out of 10) couples separate or divorce once it is determined that their child suffers a life-threatening or catastrophic chronic illness. Invariably, mothers become the single care-givers. The struggles of these lone parents and their dying children remain hidden to the world. So do the impossible choices that these mothers must make. If a mother quits her job to care of her child, the family finances shatter; And, If she chooses to continue to work, then her dying child must often face suffering and treatments alone, a frightening prospect for both mother and child. Other clinical studies completed the picture; (Shudy et al., 2006) found that nearly three in ten children live in single-parent homes. (Montgomery, Ronald, Reisner, & Fallat, 2002) revealed that mothers of chronically ill children have cited concern over the lack of opportunity for employment and Hauenstein (1987), in an unpublished study, found that 10 of 14 mothers (71%) of chronically ill children were unemployed, whereas only 1 of 11 mothers (9%) of healthy children did not work outside the home. The Compassion Can’t Wait foundation has assisted in 24 -hour turnaround time over 13.000 families, and their donations exceed 8 million dollars. They have now reached a point where they must reach out for public support in order to continue the work, without having to say NO to any single parent family with a catastrophically ill child. Your donations will enable the cause to reach and financially assist more families to fight, not only to keep their lights on and mortgages paid, but to keep their children alive, showing all the love and support they can while they can. “S” is a 6-year-old girl who is greatly suffering from an incurable genetic disease called “Familial Mediterranean Fever,” as well as failure to thrive. After almost two years of her being very sick with weekly fevers, night sweats, lymphadenopathy, rashes, chronic diarrhea, and joint pains, she was finally diagnosed last May at the Children’s Hospital of Philadelphia (CHOP). She currently has an NG feeding tube for her failure to thrive. Because of “S’s” illness, her single-mother of three children has been unable to work. Bills piled up beyond her ability to catch up and have fallen greatly behind on her payments. Compassion Can’t Wait paid the family’s overdue housing bills, auto payments, and utilities. You can help them to financially assist more families by donating to this cause today! 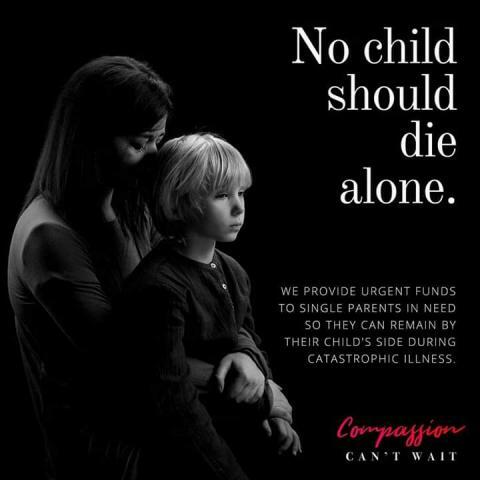 Compassion Can’t Wait enables caregivers of children with life-threatening illnesses to care for their children full time by relieving financial burdens when other resources are exhausted or unavailable. You can help by donating to this cause and sharing our message – Compassion Can’t Wait.